The air handlers that were put on the roof are walk-in size (which is pretty typical for a building of that size). With all the equipment and workings that will be going on inside the building I'm sure there will need to be a lot of cooling. One of the great things about this thread is that one can learn something new practically every day. 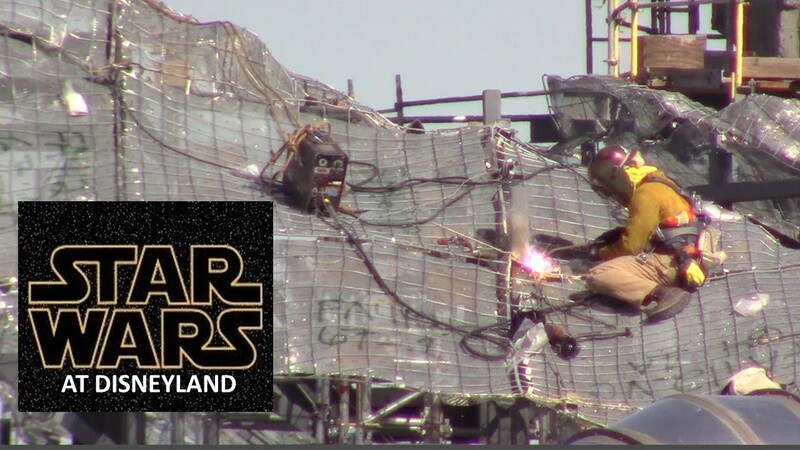 The Disney Parks Blog just posted a flyover video of the Galaxy's Edge construction site at Disneyland that was shared at the annual meeting of shareholders this morning. I'm sure more prying eyes will screenshot and dissect, but here it is for your viewing pleasure. It's astounding how much progress they've made and how much of the land is formed with structure. Two new SILA videos taken 3/6/18, this is viewing the SWGE construction from the F&M parking structure. The southern rectangular structure on top of the BE building has now been completely covered with rock work structure and mesh formwork. The rock formations of SWGE are turning out to be amazingly massive and quit impressive. I can only imagine how all of these rock formations will appear when actually viewing them when at ground level inside SWGE itself...can't wait! This is viewing the SWGE construction from Tarzan's Treehouse. 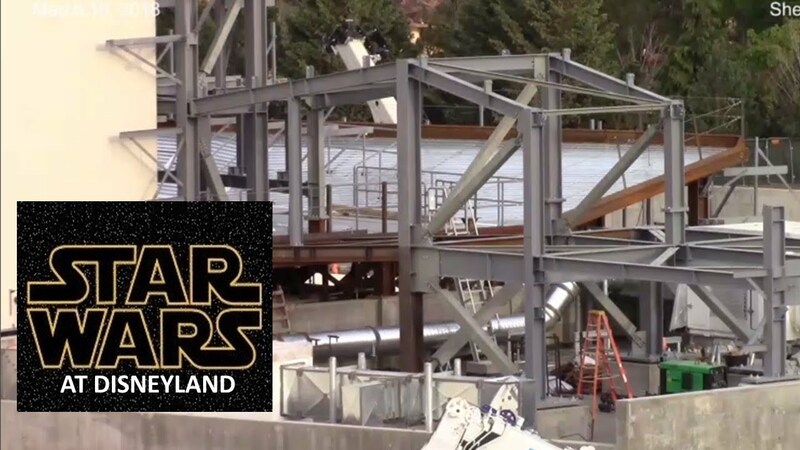 While the highly anticipated Star Wars: Galaxy’s Edge lands won’t debut to Disneyland and Walt Disney World Resort guests until 2019, eager fans can take a voyage over the Star Wars: Galaxy’s Edge construction site - right now! Last edited by DisneyMan; 03-09-2018, 11:22 AM. I surf MiceChat like I spend my time at Disneyland � sitting on the bench and watch the people go by. A third SILA video of the SWGE construction taken 3/6/18, this as viewed from the Hungry Bear. From this perspective the taller formations stand out however the overall mass is composed of horizontal rock work as opposed to vertical. To my knowledge this is the first time so much horizontal rock work has been designed and will be another raising of the bar for Disney Imagineering producing an amazing final result. Where are these rocks located? I'm hoping in America because we are supposed to be on the Rivers of America. 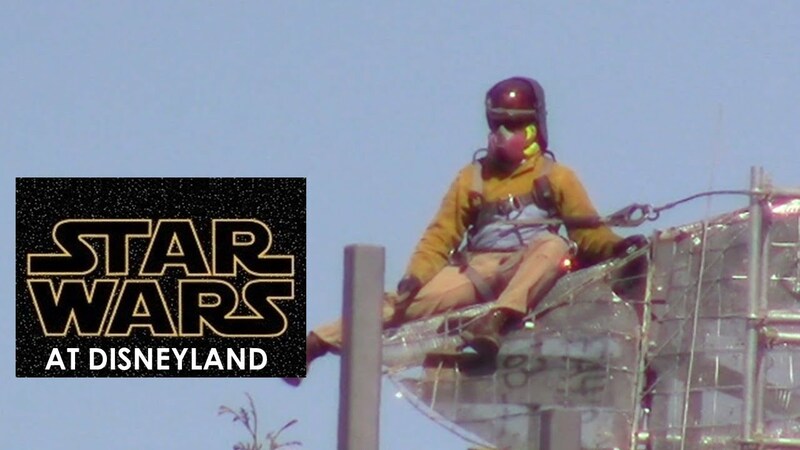 Is this tower, near the Millennium Falcon attraction, visible from anywhere within Frontierland or Critters Country? MiceChat - Disney and Theme park news, tips, planning and more! 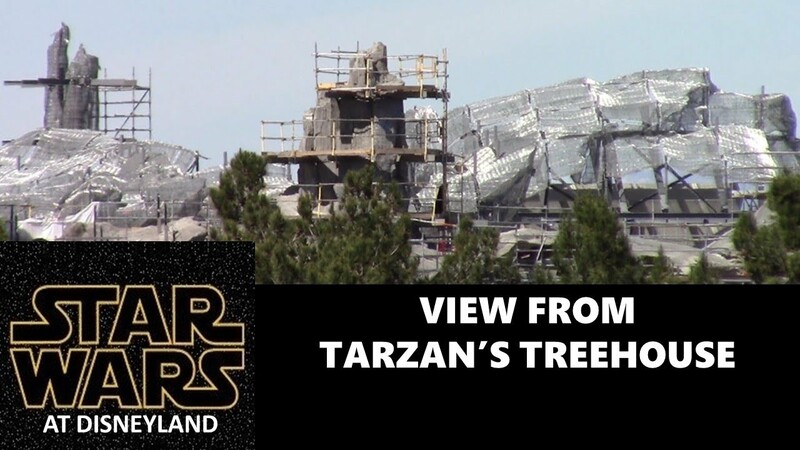 Those who have filmed the construction from the Mark Twain have zoomed in between the trees to see it, but I don't think it can easily be seen with the naked eye. Once the trees grow out some more and the deciduous ones grow their leaves back, it won't be noticeable. Is it all that big of a problem is a couple relatively nondescript structure in SWGE are visible from Frontierland or Critter Country? The Matterhorn can be seen from Frontierland, too. 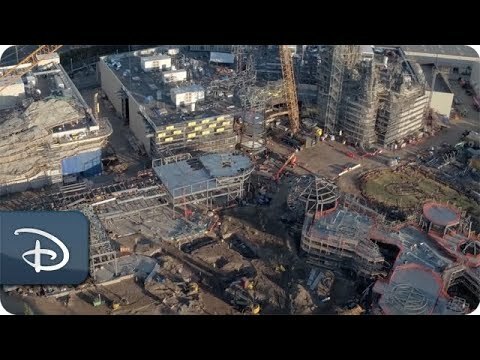 Heres a recent video of the Main Street and downtown disney construction that I took. Enjoy! Nice video. 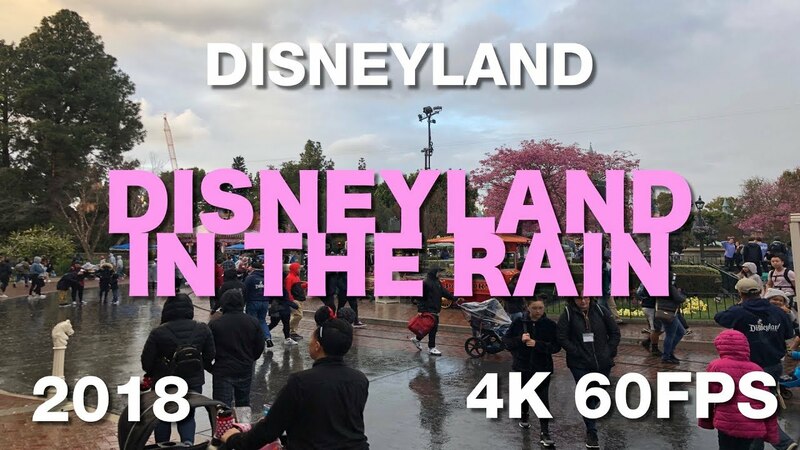 I've been to Disneyland in the rain a few times (including the latter half of Saturday 3/10). The rain does add something to Disneyland's magic, especially because it does clear so many guests and reduces crowding. A new SILA video taken Monday 3/19/18 viewing the SWGE construction from the M&F parking structure. It appears as thought one of the large crawler cranes has been removed and a smaller crane is now on the construction site. Steel support structure has been installed on top of the side building to the west of the main BE show building. Some video of the fireworks above SWGE taken from the M&F parking structure...very cool! Matterhorn is not next door to Frontierland. There is a "land" in between. SWGE is next door and there are several attractions in Critter Country and Frontierland that have riders face that direction. Why design a land, (that easily could have been made to look spacey) to blend with the near by land but have a few structures that sticks out. What difference does it make whether an attraction visually intrudes on one land over versus two lands over? Before the trees and foliage had a chance to grow in, there were originally massive sightline problems throughout Disneyland. Once the trees have a chance to grow in, around SWGE, the towers should only be barely visible, if even that. This is crazy guys! They have begun to test the ride system for the incredacoaster and we now have confirmation that they are keeping the old trains from CS!!! 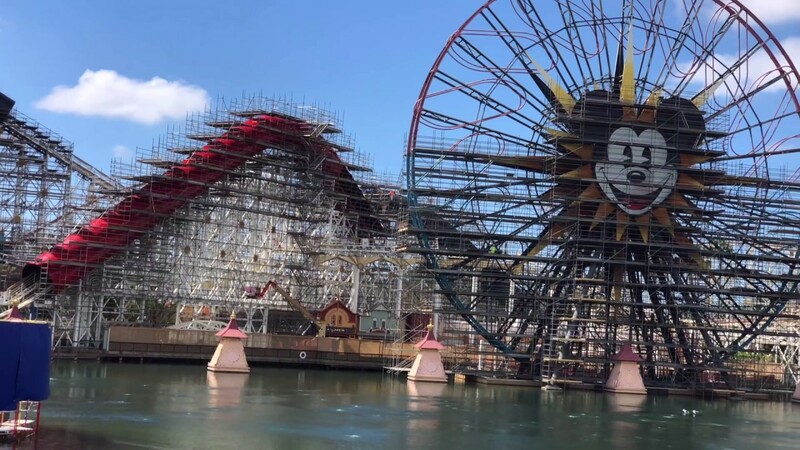 Here you can see the progress on Pixar pier along with videos of the coaster TESTING!!!!! If the trees don't grow in properly and cover those structures, I will not be surprise if there are threads complaining about it being visible.